In most museums, manhandling exposition pieces will earn you a firm reprimand from the security guard or an expeditious exit from the premises. At the Cleveland Museum of Art, however, reaching out and touching the work of the masters isn’t only allowed, it’s encouraged. 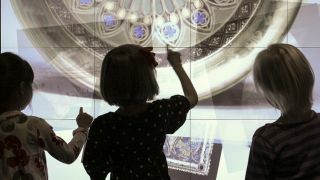 The Cleveland Museum of Art’s dynamic new video wall supports multi-touch, thanks to the Christie Interactivity Kit and RFID tags on iPad stations. Up to 16 people can interact simultaneously. Museum photos are courtesy of Local Projects. Well, in a manner of speaking. Several years ago, the museum integrated a 40-foot Christie MicroTiles video wall (consisting of two 15 units wide by five units tall displays) in its Gallery One (www.christiedigital.com). The wall supports multi-touch, thanks to its integration with Christie’s Interactivity Kit; up to 16 people may interact with the wall with the use of RFID tags on iPad stations. Search results will propose related topics, and visitors may even curate their own tour via ArtLens, an iPad app. A smaller, four-unit wide by three-unit tall display in the Gallery One’s early childhood learning zone invites up to three kids at a time to draw lines or shapes (hence its name, the “Line and Shape Wall”), and, once they have, content management software will call up similar lines and shapes from works in the museum’s collection—a way of encouraging kids to channel their inner Picasso. The Cleveland Museum of Art isn’t the only facility that’s striving to encourage people to engage with artworks through the application of AV tech. At the San Francisco Museum of Modern Art, a combination of Planar display products (www.planar.com)—including the company’s Clarity Matrix Video Wall, PS Series LCD Displays, RA Series LCD Video Wall, EP Series Ultra HD Displays, and Helium Series Touch Screen Monitors—are positioned throughout the museum, providing visitors with information on art, as well as museum events and expositions. Facilities managers are also exploring how they can engage visitors from the minute they step through the doors. The Auckland Museum in New Zealand addressed this a few years ago with the installation of a 12x7-foot, 4x4 video wall in its entrance. The 16 monitors are supported by two Matrox M9188 PCI Express x16 octal-monitor graphic cards. In 2013, an exhibit in at the National Gallery of Art ignited the imagination of art and dance enthusiasts, and captured the attention of technologists, too. That’s because of the sophisticated systems utilized for the show titled “Diaghilev and the Ballet Russes 1909-1929: When Art Danced with Music.” To interpret the art and offer context for visitors, the NGA’s AV Services department suspended ten “shelves” in the display areas. Hanging down four-feet from the Gallery’s 16-foot ceilings, each shelf contains a digital video projector (a mix of units, including the Epson PowerLite Pro G5450), a BrightSign XD1230 digital video playback unit, digital amplifier (various, including Atlona ATPA100-G2s with remotely-controllable audio), SoundTube speakers (pointing downwards to the floor), and a Wi-Fi network connection. The BrightSign XD1230s were loaded with historical ballet footage that related to the art within view, shown above the objects on walls that have been treated with projection screen paint. The painted screens range in size from six-to ten-feet in width. There were also Samsung 24-inch and 42-inch monitors in use, in areas where video projection was not practical. All of the units that used audio were equipped with Williams Sound TX238 infrared assistive listening systems. Inside the San Francisco Museum of Modern Art (SFMOMA) where new technology is helping to engage and inform attendees. SF MOMA photos courtesy of Jeff Rumans Photography. To add an air of backstage reality to The Firebird backdrop, the NGA procured a video production—originally produced by the V&A for their 2010 exhibition—of silhouetted dancers’ shadows (plus performance audio). The video was projected on the backdrop using a Christie DHD800 8000 lumen video projector—from a side angle. While the “Ballet Russes” show is no longer on display at the NGA, the innovations in technology, including an AVB system, have inspired other museums, galleries, and showrooms to explore how they can apply AV technology to provide a fresh perspective. Barco’s R-Series ■ Barco’s R-Series digital media canvas—a thin, bendable, LED display with a 10mm pixel pitch—can be wrapped around curved surfaces, or glued to flat ones. The canvases, which are 5mm thick, come in sheets of up to 4.68 meters long, with cabling, control and power integrated on every sheet in an effort to alleviate cable clutter. (Users who want easy access to the power supply unit for maintenance purposes can store it remotely.) The canvases incorporate Barco’s Infinipix image processing platform, which is based on HTML5, meaning that it can be controlled through different operating systems and mobile devices. Canon’s laser projection suite ■ Canon offers several projection solutions, including the LX-MU800Z, a laser projector that has a lifespan of 20,000 hours and is, therefore, “virtually maintenance-free.” The 8,000-lumens projector features 1920 x 1200 resolution, a contrast ratio of up to 10,500:1, and seven interchangeable lens options with motorized lens shift. Also in Canon’s portfolio is the REALiS 4K501ST Pro AV LCOS Projector, a 4K unit that includes a video interface with two HDMI 2.0 inputs with HDCP 2.2 support, as well as a Marginal Focus feature keeps content that’s on the periphery of domed surfaces in focus. The REALiS WUX450ST Pro AV LCOS Projector, at 1920 x 1200 resolution and 4,500 lumens of brightness, is a short-throw unit with a non-interchangeable lens, and features an HDBaseT receiver that allows for uncompressed HD video, audio, and control to be transmitted over a single LAN cable (up to 328 feet). LG’s 86BH5C Ultra Stretch Display in action. ■ At LG, it’s all about curves and slimness with the company’s Dual-Viewed Curved Tiling OLED (Model 65EJ5C), which lets users customize two-sided displays by linking up to four tiles together. The Ultra HD (3840 x 2160) tiles are in portrait format, and incorporate system-on-a-chip (SoC) technology at 128Gb of internal memory. LG also offers a Dual-View Flat OLED (Model 55EH5CS) in full HD (1920 x 1080), which can be wall-mounted, suspended from the ceiling, or mounted on a floor stand. The 86-inch Ultra Stretch Commercial Display (Model 86BH5C-B) features UHD resolution, and a 58:9 aspect ratio. Users may divide the long, rectangular display into a total of four seamless screens (in either portrait or landscape formats) with the manufacturer’s Picture-in-Picture technology. SuperSign, LG’s media editor, lets operators edit images and video clips (of original content) without having to use additional editing software. ■ Peerless-AV offers many systems that lend themselves well to museum environments, and the new DS-VW775 is no exception. The SmartMount Supreme Full Service Video Wall Mount (DS-VW775) features new lateral micro-adjustments and convenient pop-out serviceability, is both lighter and easier to install and service. Ideal for creating video walls in retail, transportation, entertainment, and museum settings, the Supreme Mount was designed with integrators and end-users in mind to provide a solution that minimizes installation time and associated costs. Ricoh’s Digital Signage Solution ■ Ricoh’s Digital Signage Solution packages a computer, edge-blending software, cables, and hardware to deliver a system capable of supporting 12-feet to 18-feet wide displays. The solution can be used in conjunction with the Ricoh’s RDS 2 or RDS 3 projectors, and the company touts the entire system’s portability in applications where users need to move things around to reach their target audiences at any given time. Sony’s Crystal LED Canvas ■ Sony’s Crystal LED Structure (CLEDIS) Canvas is an immersive, seamless, direct view display with a viewing angle of almost 180 degrees, and incorporates the manufacturer’s ultrafine LEDs. Sony explains that because each pixel is only 0.003 mm2, the remaining surface area is 99 percent black, which accounts for Canvas’ brightness, color quality, and contrast ratio of 1,000,000:1. The display supports High Dynamic Range (HDR) content, resulting in 10-bit color depth. The system is scalable, comprising a number of units of 18 x 16 inches each, which can be joined together without the need for bezels. For those who need to get video to viewers fast, the company highlights the use of its pixel drive circuitry that delivers a frame rate of 120 fps. And, in environments where visitors can’t get up close to exhibits physically, Sony says that Canvas can serve as a “life-sized” virtual museum application. Carolyn Heinze is a regular AV Technology contributor. Margot Douaihy is the editorial director of AV Technology. A portion of this feature is an update of our National Gallery of Art coverage.